Cost subsidized by charitable donations, bring the unprecedented success of America's most successful and cost efficient crime camera program to your community for as little as $15/ month. Crime Cameras with Built-in Gunshot Detection Now Available! 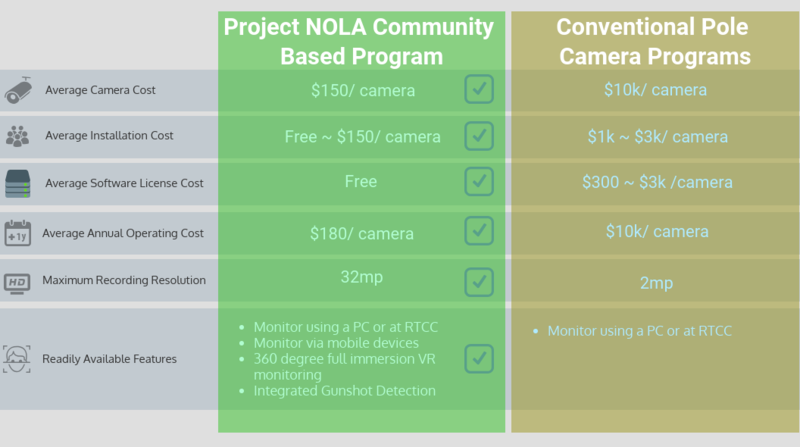 ​In 2010 Project NOLA began to work with residents and business owners to create a privately funded community-based crime camera program, without the benefit of federal grants or local tax dollars, which has grown to currently involve over 2500 HD cameras and has helped the NOPD reduce murders in 2018 to the lowest rate since 1971. Q1 2019 murder rate is down an additional 46% vs Q1 2018! A charming city suddenly faced with escalating drug-related gun violence, the City of Natchez quickly turned the tables on violent criminals by partnering with the community to place Project NOLA crime cameras with Gunshot Detection on homes and businesses, which instantly helped detectives solve a murder and more effectively dismantle illegal drug distribution operations.